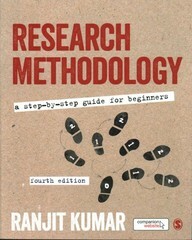 Research Methodology 4 Edition Lecturers - request an e-inspection copy of this text or contact your local SAGE representative to discuss your course needs.Research Methodology: A Step by Step Guide for Beginners has been written specifically for those with no previous experience of research or research methodology. Written in a logical and accessible style and providing helpful techniques and examples, it breaks the process of designing and doing a research project into eight manageable operational steps. The book guides you through your project from beginning to end by offering practical advice on:formulating a research question ethical considerations carrying out a literature review choosing a research design selecting a sample collecting and analysing qualitative and quantitative data writing a research report. The book is essential reading for undergraduate and postgraduate students in the social sciences embarking on quantitative or qualitative research projects.